We would again like to share with you some comments from the July 2007 Issue of Zeal Intelligence from editor, Adam Hamilton, CPA, which we are providing in its entirety with his permission. Warrants are a unique trading tool that is highly underappreciated and potentially incredibly profitable. The above calculations are using ‘conservative prices’; not the highest high nor the lowest low and they are in Canadian dollars. For those investors craving more information, let’s say leverage, or at least potential leverage, is the prime reason an investor would be interested in warrants. The owner of the warrant receives none of the benefits of ownership of the common stock of a company. He cannot vote, and he does not receive any cash dividends. Why would an investor want to buy an option (warrant) to buy something instead of buying the thing itself? The essence of the answer is that the anticipated gain on the warrant must be greater than the anticipated gain on the common stock. This more rapid growth in the value of the warrant relative to the common stock is called leverage. The advantage that a warrant offers the investor is leverage, that is, a greater gain than would be possible with an equal investment in the common stock. Without this possibly of such leverage the investor would buy the common stock. No one would purchase and exercise a warrant when we can buy the common stock for a price that is less than the exercise price of the warrant. What will be the minimum price that an investor may be able to pay for a warrant? The answer is the theoretical value of the warrant, the warrant’s intrinsic value as an option. This intrinsic value is the price of the common stock minus the per share exercise price of the warrant. If the common stock is selling for a price greater than the per share exercise price of the warrant, the warrant has some positive theoretical value. If the common stock is selling for a price that is less than the per share exercise price of the warrant, the warrant has no real value as an option. The theoretical value of a warrant considers only the intrinsic value of the warrant as an option. It does not consider the possibility of leverage that the warrant may offer the investor. It is this possibility of leverage as well as the theoretical value of the warrant that influences the market price of the warrant. Since the investor gets both the theoretical value of the option and the potential leverage that the option offers, the market price of a warrant usually exceeds its theoretical value. If a warrant were the option to buy common stock for $20 a share and the shares were currently selling for $30, then the theoretical value (intrinsic value) of the warrant is $10. Why is $10 the lowest possible price for this warrant? The answer is that if the market price of the warrant were less than $10, there would exist an opportunity to arbitrage, and the act of arbitrage would drive the price of the warrant to its theoretical value. The professional arbitragers will guarantee that the market price of a warrant cannot remain for any length of time below its theoretical value. An investor may purchase a warrant which is the option (the right) to purchase the common stock of a company. He may prefer to purchase the warrant instead of the common stock because the warrant offers more potential gain, that is, the warrant offers the investor leverage. What effect does the premium have on the potential leverage that the warrant offers? The higher the premium you have to pay for the warrant thus decreases the potential leverage that the warrant offers. 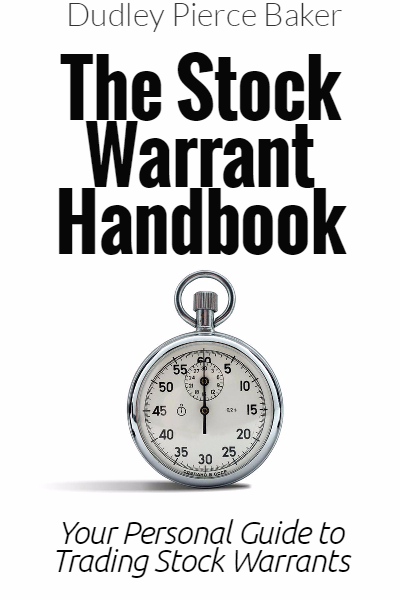 Assuming the market price of the common stock is $25 and an exercise price of $20, the theoretical value (intrinsic value) of the warrant is $5, but the market price of warrant is $14. The investor must pay $14 to purchase the warrant and thus he is paying a premium of $9 over the intrinsic value of the warrant. Investors goals are to find the warrants which exhibit a reasonable premium and thus provide the highest leverage potential possible. In our warrant database, we do these calculations for you in a simple format easy to understand. As long as the leverage factor is greater than 1 to 1, the price of the warrant will rise more rapidly than the price of the common stock. While the existence of the premium decreases the leverage, it need not eliminate it. An investor, who is considering purchasing a warrant, must ask himself what price increase can he expect in the warrant if the price of the common stock rises. We provide you this detail in our warrant database. For the warrant to be attractive, the anticipated percentage increase in the price of the warrant must exceed the anticipated percentage increase in the price of the common stock. Simply put, the warrant must offer the investor leverage. Much of our information presented on our website comes from our collective knowledge of over 30 years of investing. However, we want to acknowledge some of the professionals whose writings back in the 1960’s and 1970’s are timeless and are as relevant in today’s markets as they were back then. We have taken the liberty in some cases to utilize their information for the purpose of explaining warrants to our readers. Sidney Fried, RHM Associates and Herbert B. Mayo, Ph.D.